Five-star Shiraz Pars Hotel located in the central district of Shiraz is consisted of two buildings and 13 floors that two floors of restaurant and lobby are connected to each other. This beautiful restaurant of the hotel on the 13th floor named Lotus Restaurant has a unique city-facing landscape.One of the most luxurious hotels in south of Iran, with well-trained and experienced staff is located on the most important street of the city, Karimkhan Blvd. The hotel is consisting of two towers with 194 rooms, suites and apartments with the most modern & latest facilities for a pleasurable stay and is just 20 minutes away from the international airport. You will experience a nice travel in the Karimkhan hotel with a traditional and simultaneously very luxury and modern stays. 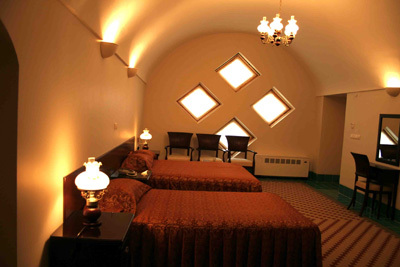 The traditional karimkhan hotel has 51 various rooms that is affected by Iranian architecture that makes you feel relaxed and have a comfortable stay. 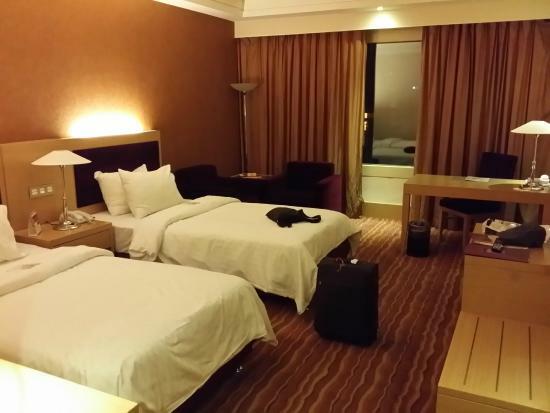 Single, double rooms and suites of hotels are so perfect for your long-term stay in beautiful city of Shiraz. The room interior services : refrigerator,Television (Tv set), Telephone, rooms’ heating and cooling system,The central system of antenna, wifi, safety-deposit box, electronic card system of doors, minibar, bathroom and Extra services. The traditional tea house of karimkhan hotel is a place with an Iranian design that will host you with traditional tea, herbal tea, ice cream and faloodeh (or paloode : an Iranian cold dessert) and make your stay more enjoyable. Also you will enjoy traditional music and use wi-fi. 224 tastefully decorated guest rooms including luxurious suites.Modern room facilities such as Wi- Fi high speed internet and LCD TVs with satellites access.State of the art air conditioning and ventilation systems.Glamorous halls for all types of events, gathering and conventions.Continental Breakfast Buffet and International cuisine Presented by any of our three restaurants offering the best service in food and drink.Complete and modern ‘’ Fitness Center’’Relaxing and friendly lobby area with Coffee Shop& Piano lounge.The best and largest private parking facility totally eliminates parking issues for guests and all who use Espinas Hotel services.Espinas Hotel is a grand family residence situated right in the heart of Tehran capital city center. The superb location of the hotel surrounded by Tehran most spectacular attractions and its accessibility to public transportation terminals, makes it perfect not only for a day tour visiting our cultural heritage such as Carpet , Glass , Golestan Palace, Ostad Saba Museum, and Big Bazar, but a very top choice to stay in Tehran for both business and pleasure, a hotel by a growing collection of distinguished properties around Iran. Considering the importance of Tourism Industry and Iranians hospitality well-known throughout the world, rooted in Iranian culture for centuries, has encouraged the owners of the hotel to expand their business by increasing the number of Espinas Hotel branches. To address your curiosity, it’s worth mentioning that The Espinas name was proudly born from the highest mountain in the geographical area of Astara City-Gilan province and means settling down in highland area. What we have rendered to our guests so far and how we are trying to better our services has all been for creating a peaceful and comfortable atmosphere for our guests. Nevertheless, we have been awarded the following prizes and credentials from respective authorities. Tehran Azadi Grand Hotel is one of the best 5 star hotel in the whole Iran, recently restore during the Tehran International Exhibition, the hotel is a place for both tourists who want to enjoy the beauties of the city and business men, in fact, the hotel houses a number of conferences and congresses, and political and governmental gatherings of various kinds. The hotel offers a staff of experts and professionals who provide great service and high level in guests treatment. on 24 floors, fully air conditioned and equipped with every comfort and service, the hotel offers a staff of experts and professionals who provide great service and treatment of guests. Facilities include a bar and 3 restaurants serving the most delicious dishes of Iranian and international cuisine, internet cafe with satellite connection wi fi, spa with pool, sauna, tennis court, gym, Jacuzzi. Standing majestically at the old beautiful alborz mountain range offers you the fine art of iranian traditional hospitality in the international level. 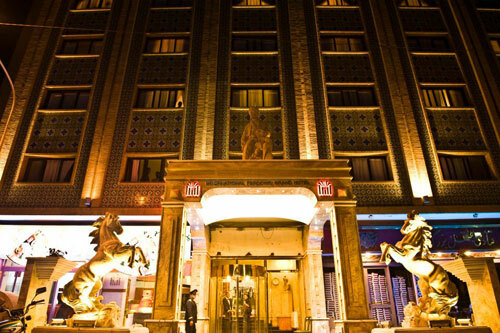 It boasts of a traditional admirble service, with carefully blended luxurious appointments to imperess the international businessmen and vips.Esteghlal Hotel (Ex-Hilton) is the greatest 5 star international hotel in Iran with the area of 70000 square meters. The West Tower established with 259 rooms in 1962 and the East Tower was inaugurated with 291 rooms in 1972. The Evin Hotel in Tehran, Iran, is about a five-minute ride from the International Trade Fair in Shemiran. 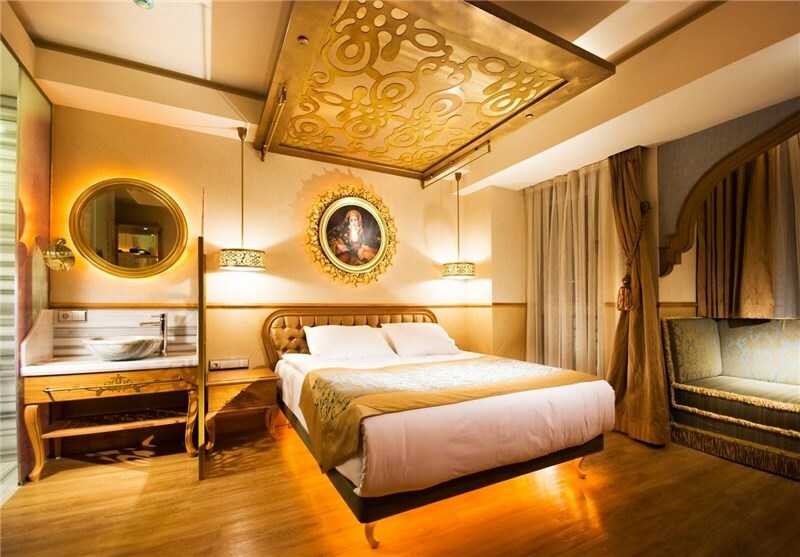 This 4-star hotel is also easily accessible from other popular destinations in Tehran, including the city’s commercial center and airport. The Evin Hotel houses rooms and two suites, plus great facilities and services like an outdoor pool, a tea house, a tennis court, and a gym. The hotel also has an on-site shopping center. 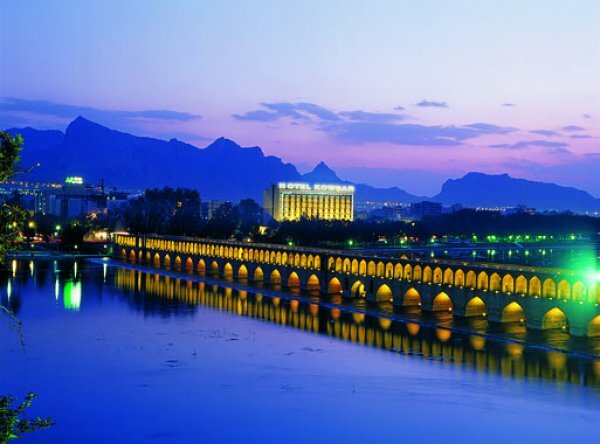 The hotel rises on 16 fully air-conditioned floors; on the top floor you will find Syriana, the first “Revolving Restaurant” in Iran, which offers a spectacular panoramic view of the Alborz mountain range. For guests relax moments also a coffee shop where you can enjoy happy hour with shisha and Arabic music, spa with sauna and jacuzzi, outdoor swimmingpool (access allowed only to men ), barber shop and shopping center. In hotel you can also find meeting rooms that can accommodate up to 1000 people and audio / video equipment needed, wi-fi and parking. 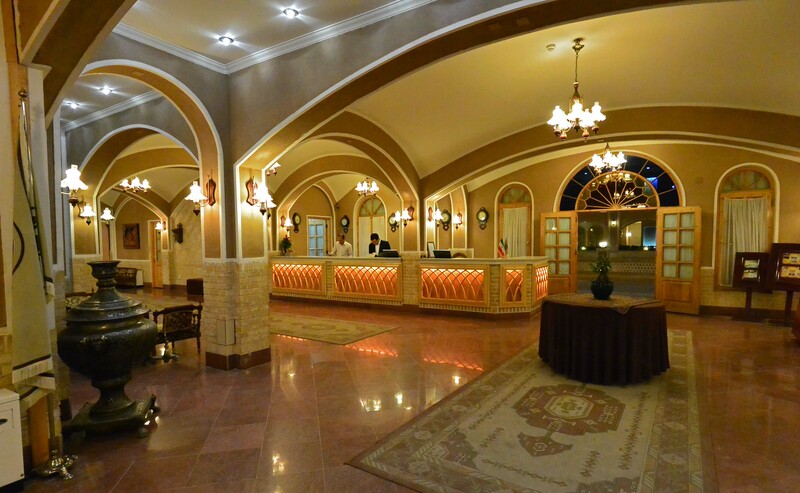 The SHAHR HOTEL has been built by Tehran municipality in 1372 at the main entrance of the east of Tehran with a traditional Architecture in an 10,000 m2 ground.SHAHR HOTEL is equipped by 110 rooms with traditional, modern & classic decorations. Each has 24 – hours room service, boundary and pool. 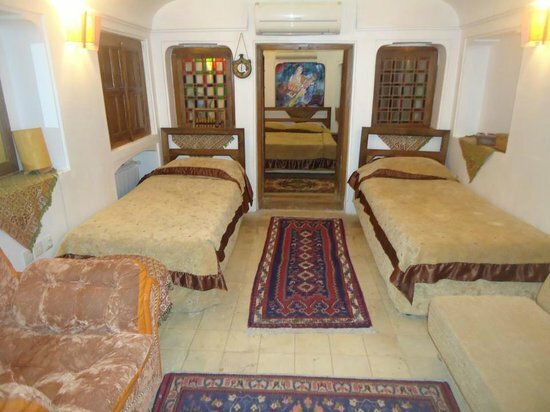 All of the rooms have lavatory and some have Iranian lavatories. The VIP rooms are also equipped to give special services to your special guests. 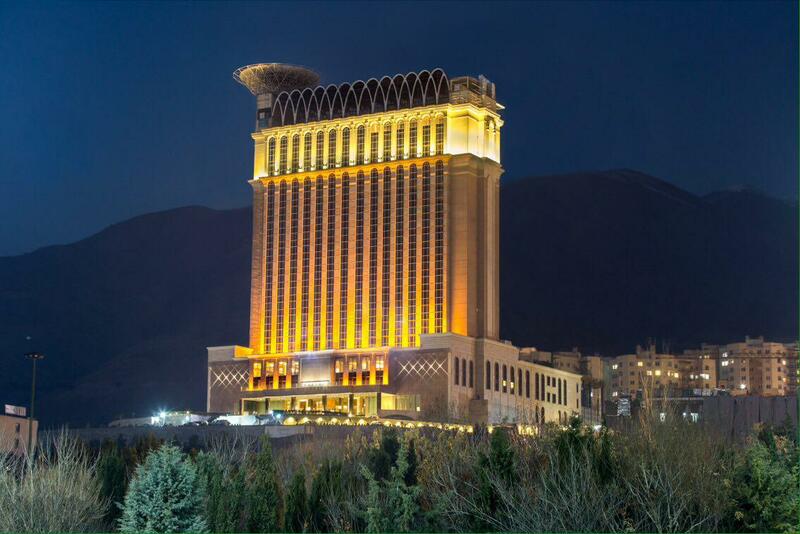 With 22000 square meters of floor space Ferdowsi Grand Hotel was first opened. Renovations and improvements have brought pleasant and modern changes yet we have also the touch of Persian heritage as well. This hotel has suites, and royal suites and restaurants. We offer traditional and modern Iranian cuisine and well as international cuisine and a buffet. Glorious Architecture of Iran has always shone as bright gem in the world of architecture and has been a long time.The School of Architecture has been at the forefront in terms of the way the name is glorious and famous in Iranian art and culture around the world.During the Safavi Isfahan will benefit from so-called glory of the worlds half.Among the surviving works of Safavid architecture has remained on the school and the market and caravanserai set in the side that shines like a gem unique Chahar Bagh Street.It was built on the orders of Shah Soltan Hossein Safavi and offered it to his mother.The Abbasi Hotel (formerly known as the Shah Abbas Hotel) is a hotel located in Isfahan, Iran. This complex was built at the time of king Sultan Husayn of Safavid about 300 years ago. It was built as a caravansary to provide lodging for passengers. The structure has been recovered since the 1950s to fight and prevent degradation. 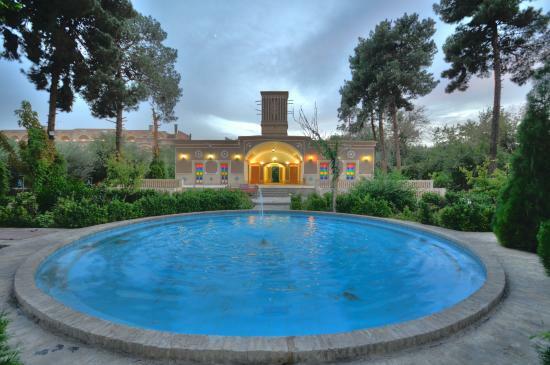 This well-run midrange option is in a fantastic location between Naqsh-e Jahan (Imam) Sq and the Zayandeh River. Rooms are comfortable, with satellite TV and good-sized bathrooms, and the hotel is set back from Felestin St, minimising noise. The rooftop teahouse is a wonderful place to relax in summer. Wi-fi costs US$2.30 per hour. This hotel is an ancient mansion once belonged to a guy named Haj Ali Askarshirazi, one of the well known business men whose title “malek al tojjar” was bestowed by Naser al din shah,a king of the Qajar dynasty, due to his trustworthy. His descendants of four generations lived in this house. 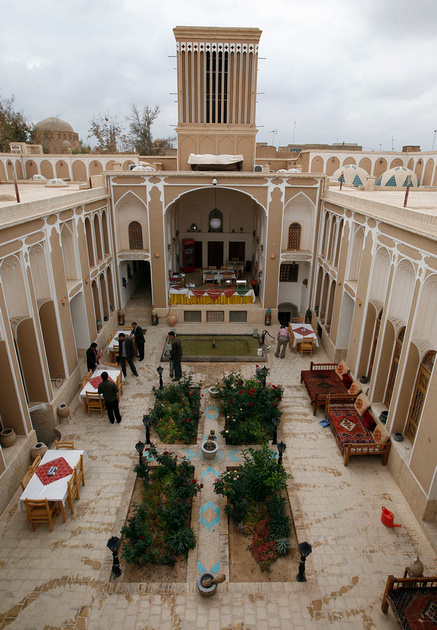 This hotel is situated in an old mansion known as “Tehraniha house”, which belongs to Qajar era.The Tehrani family, carpet traders, lived in this house some 250 years ago. Honoured of running the first national museum hotel and benefiting from 30 rooms and 80 beds,we welcome the national and international guests all year long.available antiques on view are of the unique features of this place.the central courtyard and the orangery are the coffee shop and the the restaurant. 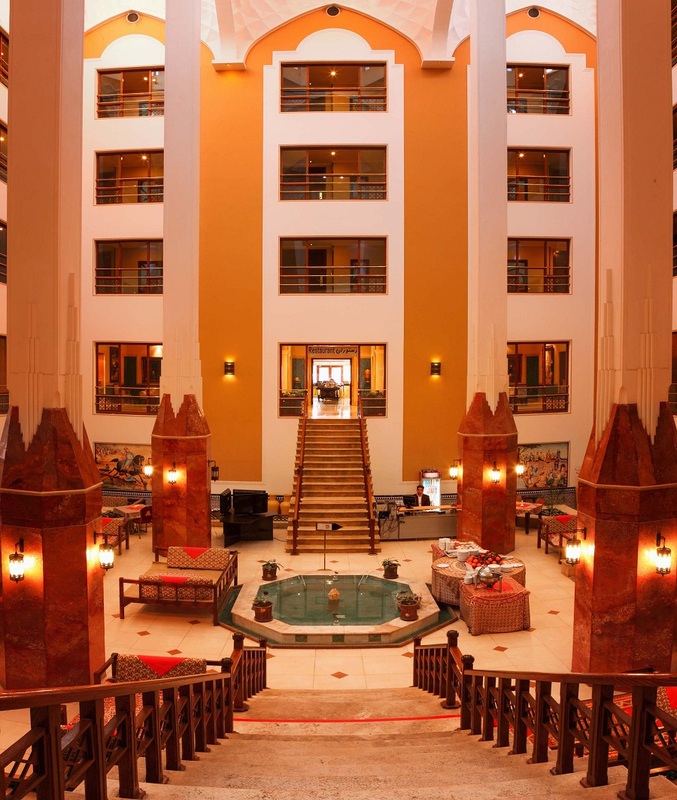 Set in a beautiful landscaped Persian garden with water features the traditional Moshir Al Mamalek Garden Hotel is traditionally styled with vaulted and domed ceilings, murals and tile work. 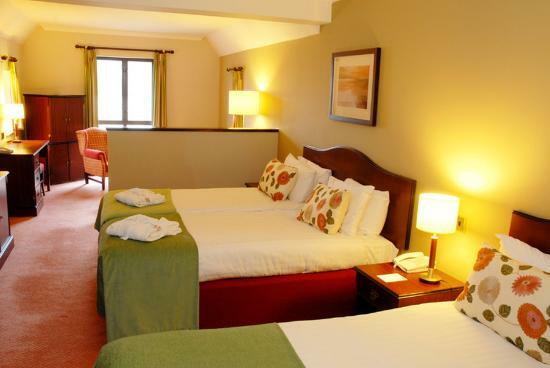 The modern rooms are stylishly designed, clean and come with televisions and fridges. 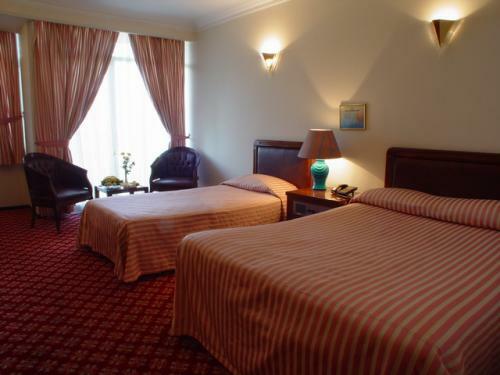 The hotel is located on one of the main streets in Yazd and is close to the main tourist attractions and sites. The two resident Macaws who reside in the courtyard add to the hotels charm. 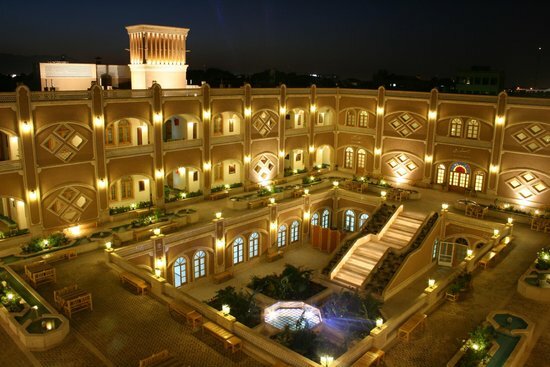 Adibolmamalek Traditional Hotel with more than 200 years antiquity, belonging to the Qajar period as a precious gem, born of the desert located in historical context of Yazd. This complex is contained Panj Dari (Shah Neshin) se Dari, Do Dari and a glorious hall with 2th floor’s rooms that makes a nice concurrent complex, traditional both is one of the lovable exploits and unique of this complex, also the basement (Sardab), a place that has current water of aqueduct with so variation warmth, a location that you could find in aristocracy house for summer restroom and for saving of food materials. 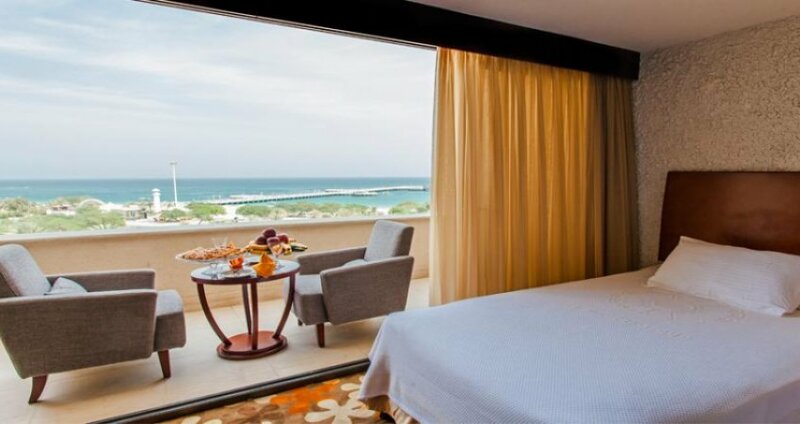 The Toranj Marine Hotel is located in the northwest of Kish Island (Persian Gulf, Iran). The complex comprises of two segments, namely water villas (operational) and onshore hotel (under construction). The water villas are linked via a wooden jetty and designed in the form of Paisley, an Iranian national symbol. The water villas have a dedicated private balcony and include 100 suites of 40 m2 (classic suites), 60 m2 (royal suites), and 120 m2 (Imperial suites) with the capacity of 2, 4 and 6 persons, respectively. Through a glass floor, each suite has a direct seafloor view. The Toranj Marine Hotel offers you an exceptional experience of being close to nature and water. It lifts up the spirit; it gives you a sense of indescribable calmness and peace. Major research across the Kish Island was carried out to select the best location for the Toranj Marine Hotel. The northwest coast of the island was selected due to sea uniformity in the depth of 1000 meters. Such depth introduces a natural barrier against storm and intense sea waves. Considering the uniqueness of water villa’s construction, specific care is paid to the preservation of marine natural beauty and ecosystem. The design and construction philosophy of the hotel have been based on environmental friendliness and minimal damage to the ecosystem. We trust that our honorable quests would also respect our design rules and behave accordingly. Dariush Grand Hotel was built as a look like Persepolis, a symbol of the glory and splendor of the ancient Persian (Iranian) civilization and the Persian Empire. The hotel was designed and developed by Iranian entrepreneur Hossein Sabet, who also owns and manages several tourist attractions and hotels in the Canary Islands. The hotel was completed in 2003 and is owned by a number of companies. Shah yelani Home stands in center of darb- bagh in kashan and is related to Ghajar- Pahlavi Period the traditional Home, was registered as a National Monuments of iran on mordad 19, 1384 with the registration number 0f 12970. Shah yelani Home in the ghabrestane darb-bagh is one of the traditional homes in kashan wich has two seprated yards, inside door and outside door. Whole house consists of two floors in tree side around the yard. most important architect parts are two cellars, shah neshin, Antechamber, winter balcony , summer balcony and a windward. most designs of the house are painting on the tore of the summer balcony.